Pixi Beauty always has a special place in my heart. Their Glow Tonic is worth all the hype and I have been repurchasing this wonderful product for about five years. At the beginning of this year I popped into the Pixi Store at Carnaby Street, London to pick up yet another bottle of Glow Tonic when I saw this product. 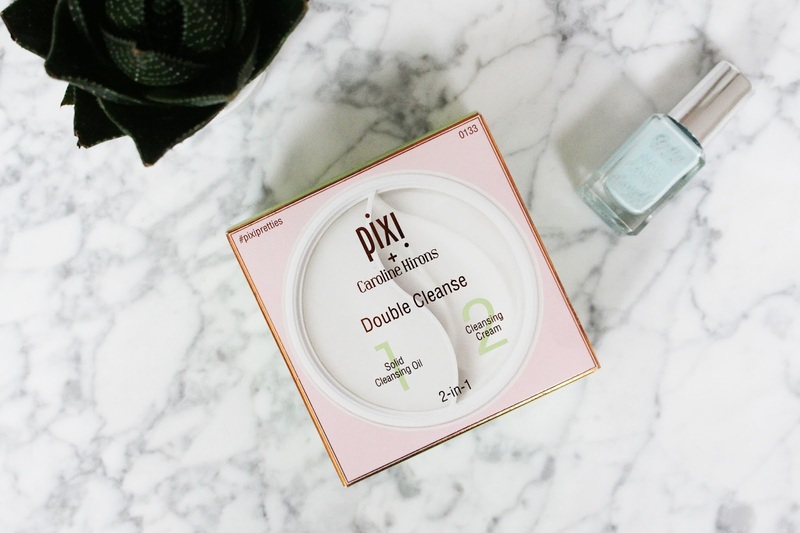 I had actually heard a bit about a product created by skincare goddess Caroline Hirons in collaboration with Pixi: The Double Cleanse. Since she does know a thing or two about good skincare and I can never say no to a cleansing balm I picked it up. This all took place at the beginning of this year and you are probable wondering why it would take me so long to try it out. Well, I was finishing up my bottle of the Una Brennan Cleansing Oil and I am quite scared of trying new skincare products. Especially cleansing balms and oils, since I have had a few bad reactions to these kinds of products in the past. After one use I already knew that there was nothing to be afraid of, because well, this product is the dreamiest thing ever. The Double Cleanse is a 2-in-1 cleaner with a solid cleanser on one end and a cleansing cream on the other. I am a huge fan of double cleansing and I think this product absolutely nails it. First, the cleansing oil removes oil, dirt, make-up and sunscreen. It's full of vitamin E, camellia oil and evening primrose oil to heal, protect and nourish the skin. The cleansing cream cleanses and conditions the skin to prep it for the rest of your skincare routine. They added Vitamin C to the luxe cleansing cream, which I think makes it even better. It's also fragrance and paraben free and not tested on animals. I like to use a pea size of both cleansers and massage them on my face for about 30 seconds. I take the cleansing balm off with a cloth and some warm water and the same goes for the cleansing cream. After, my skin feels so radiant, soft and healthy. I also feel like my skin is smoother and less prone to acne. Now there are some cons. Personally, I don't like the fact that it's in a jar. I love cleansers in a tube, because it's much easier and hygienic. Now I scoop out the cleaners with a cotton bud to keep my germs away from the product as best as I can. It's also on the pricier side (£24), but I can totally justify that now that I know how amazing my skin looks after using it. If you are a cleansing balm hoarder then I would definitely recommend this product (also if you are not skincare obsessed you will love it). I think the two products work so well together to make the skin plump, glowy and healthy. One jar will probably last for about three to four months, which is reasonable as well. Hopefully Pixi will bring out a travel size, because it has to come on holiday with me. 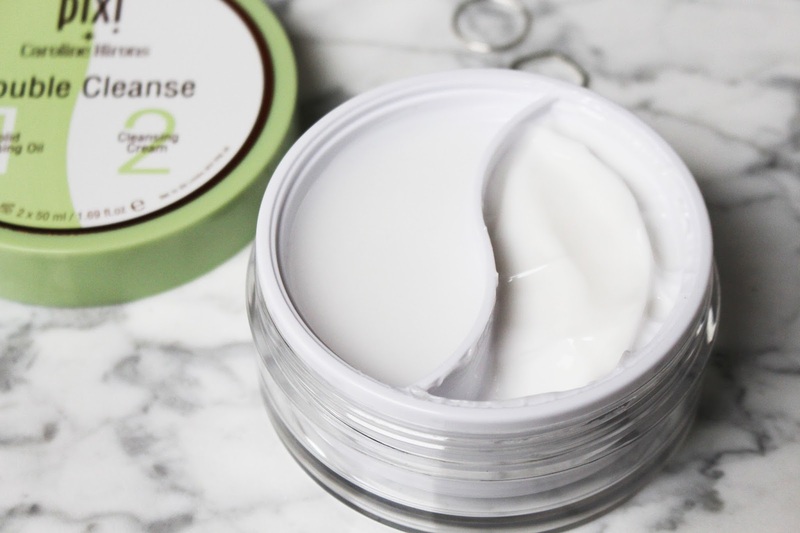 Think about how cute a tiny Double Cleanse would be! Have you tried the Double Cleanse from Pixi Beauty already? What are your thoughts on this product?